WASHINGTON DC — The thing about clean energy in America is that clean energy is all across America. That’s simple, but it’s important. Clean energy isn’t limited by deposits or reserves. We don’t have to travel to the harshest ends of the earth to access sunlight for solar energy, or blow the tops of mountains or send miners underground to harness the wind. Energy efficiency can make any office, home or school better and smarter. That’s why when you look at where the 3.2 million clean energy jobs are in America, you’ll see they’re in every state — and in every city. This week, as part of National Clean Energy Week in Washington, E2 released its first-ever Clean Jobs Cities report, ranking the top 50 metro areas in America for clean energy jobs. Cities are at the core of America’s energy consumption and needs. In nearly every major American city, buildings consume more energy and are responsible for more carbon pollution than any other end-use sector. Making those buildings more efficient and cleaner is creating jobs. Our latest report shows that nearly 60 percent of all clean energy jobs (1.8 million) are in 50 metro areas. 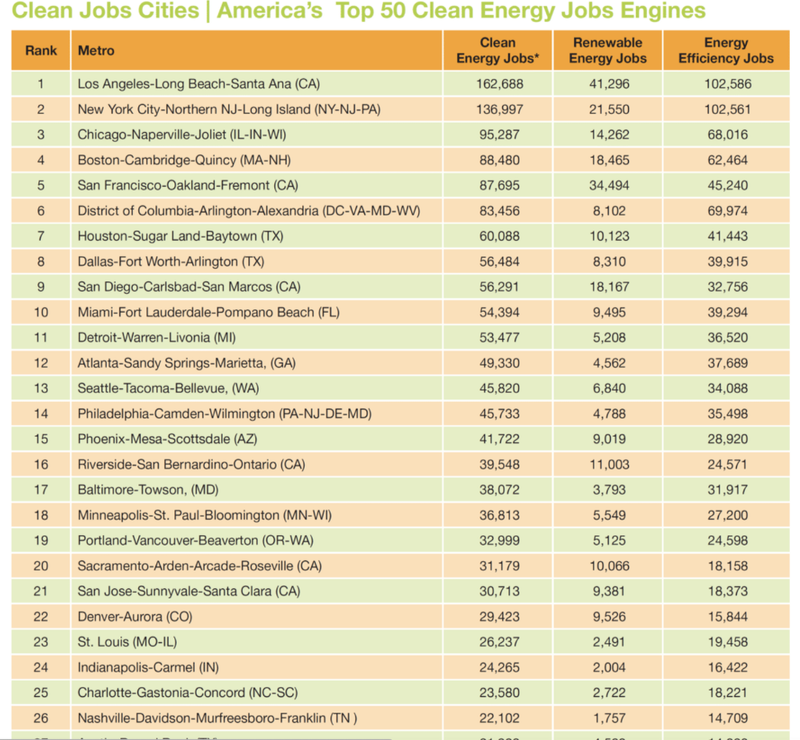 Not surprisingly, Los Angeles, New York and Chicago lead all U.S. cities in clean energy jobs. Look a little further down the list, though, and you’ll see some surprising standouts. Houston, the hub of America’s oil industry, is №7 in clean energy jobs. The Detroit metro area is №11, while Philadelphia, in the birth state of America’s oil industry, ranks №14. Then there are red-state cities, like Charlotte (№25) and Nashville (№26) and Louisville, KY (№44). What the city rankings show is what we’ve known all along at E2: That clean energy knows no boundaries — geographically or politically. The sun doesn’t shine any brighter on Republicans and the wind doesn’t blow any steadier on Democrats. Energy efficiency is neither liberal nor conservative. That was also the over-arching message at National Clean Energy Week forum in DC. Organized by the right-leaning Citizens for Responsible Energy Solution (CRES) and featuring mainly Republican lawmakers, much of the D.C. forum focused on renewable energy, energy efficiency and clean vehicles. Both in and outside of Washington, Republican lawmakers championed clean energy this week. Republican Utah Gov. Gary Herbert spoke of how proud he was that Utah is the №6 state in the country for electric vehicles. In Iowa, Republican Gov. Kim Reynolds signed a proclamation declaring Sept. 24–28 as Clean Energy Week, noting Iowa’s rank as №1 for wind energy last year and the impact it’s had on the state’s economy and environment. New Report, Elected Officials Show That Geography and Politics Don’t Matter For Clean Energy Jobs was originally published in e2org on Medium.